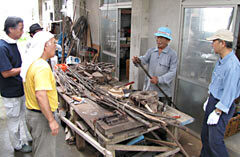 On June 11 at Shutoku Sakihama’s house in Taira, Nago, members of Nakijin Gusuku wo Manabu Kai learned how to make canes with the wood of Randia canthioides. Members of the Nakijin Castle guide volunteer group, Nakijin Gusuku wo Manabu Kai have made 60 canes so seniors and disabled people can enjoy the tour of the castle ruins. They collected wood of the Randia canthioides (dashicha or dashika in the Okinawan dialect) from the mountain area of the Yambaru and dried them out for two months. On June 11, members gathered at Shutoku Sakihama’s house in Taira, Nago, and finished making the canes under Sakihama’s guidance. Randia canthioides blossoms with white flowers in the early summer. Its wood is dense, hard, and elastic. According to the mythology in the book, Ryukyu Shinto ki, written by Taichu Shonin, who introduced Jodo shu to the Ryukyu Islands, the Ryukyuan gods of creation, Amamikiyo and Shinerikiyo created the world by making mountains with dashicha. At Sakihama’s house, through a process of trial and error, the members of the group worked to adjust the canes to the appropriate length and grip. Vice chairman of the group, Isao Otahara, looks forward to telling people about the creation myth when members guide visitors around the castle ruins.